Shipwrecks occurred with alarming frequency in our early coastal seafaring history. Violent storms, heavy seas and hidden reefs plagued sea captains as they brought vessels across the mouths of rivers and into port. 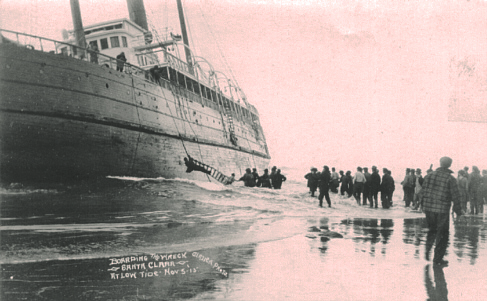 One of the most tragic and documented maritime disasters on Oregon’s South Coast was the wreck of the 223 foot Santa Clara. 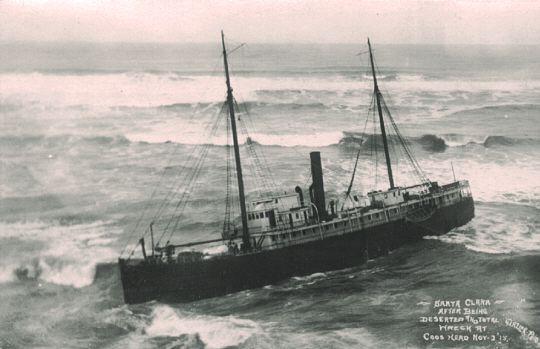 The wooden steamship was inbound on her run from Portland to San Francisco, first stopping at the port of Coos Bay. About 60 passengers and crew were aboard, many from the Portland area, as well as 6,400 pounds of parcel post mail, personal household possessions and Christmas merchandise. In the late afternoon of November 2, 1915, she struck an uncharted shoal at the entrance to Coos Bay. Captain August Lofstedt faced a critical situation. The ship was breaking up and water was flooding the engine room. Steering gear and wireless radio were inoperable. Lofstedt ordered lifeboats lowered. The ship first capsized as it approached the shore, drowning eight women and children. The captain and six crew members were in the last lifeboat. Its ropes broke; all were tossed into the roiling water but swam back to the ship to await rescue. Badly injured survivors suffered from exposure, burns, and broken limbs. Exhausted and cold, they waited for help. Several factors hampered immediate assistance. Churning surf, heavy rain, and fog delayed the Coast Guard lifesaving station at Charleston. Locals loaned cars to drive the living and dead to Marshfield (now Coos Bay) and physicians arrived as quickly as possible, but the 18-mile trip from town meant driving on mud wallow roads. The site was otherwise accessible only by trail. The Deputy U.S. District Attorney found no maritime laws forbidding the taking of salvage. In his opinion, state rulings prevailed. Parcel post was the exception. Federal law prohibited tampering with mail, providing an opportunity to indict looters. Postal officials began an investigation that continued until the following summer. By the third day, the ship’s owners hadn’t given merchants permission to retrieve the goods. Exasperated retailers hired men to board the vessel and take what they had paid for. A free-for-all of looting followed, fueled partly by casks of liquor the “pirates” opened and distributed. The raiders threw the booty ashore, keeping piles of food, ship’s fittings and housewares for themselves. An attempt to facilitate the plundering by placing dynamite under the bow failed. Canned and paper goods, clothing and anything else of value that wasn’t salvaged or pirated were destroyed by leaking oil and water. Within a week, arsonists torched the wreckage, burning nearly everything to the waterline. Metal thieves continued to make off with boxes of linotype, engine parts, and brass. The legacy of the Santa Clara is one of dark deeds, financial loss, and human tragedy, including 12 known dead and five missing. Captain Lofstedt stood trial for negligence, pled guilty and lost his master’s license. Insurance inquiries, lawsuits and petitions arose and were settled the following year. It was eventually determined the ship’s steering gear was not working properly before she went to sea.